My family surprised me with a raised bed garden for Mother’s Day a couple of years ago. My husband and boys built it themselves, and we joined the ranks of backyard gardeners. While I have never had a green thumb, the experiences we share as family gardeners are priceless. When my boys show excitement over things like a baby tomato or a flower on a squash vine, all the hard work becomes worthwhile. A garden is an easy thing to incorporate into our homeschool as we study seeds, plants, and even insects. We also gain more respect for God’s creation. 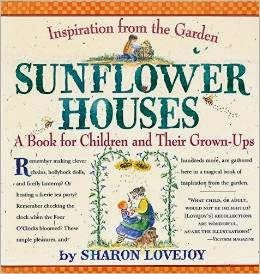 Sunflower Houses: A Book forChildren and Their Grown-Ups is a wonderful resource full of ideas to awaken children to an outdoor world of wonders. The author’s love of gardening and nature shine through in her writing. Children fear what they do not understand. A good case in point was the unreasonable terror I felt as a child in a garden full of dragonflies! As soon as the dragonfly was explained to me, the fear disappeared. Take the time to introduce your child (and yourself) to the lady bird beetles, praying mantises, and other interesting and beneficial bugs who feed on the larvae and adults of destructive insects. Hosting a healthy population of these friendly critters can help make your garden a thriving, pesticide-free environment (p. 41). Susan Lovejoy shares creative ideas that spark our imaginations, revealing her knowledge of gardening with children. The ideas in Sunflower Houses will keep us busy outdoors throughout the spring and summer. My boys can hardly wait to grow a zucchini “fish” inside a bottle. I especially like that Mrs. Lovejoy focuses on sharing nature’s wonders with children in a way that inspires them to become caretakers of the world around them. I guess in some ways, the small miracles we can create for our children are the ones most treasured and remembered. My small miracle of a butterfly and moth garden occupied about ten square feet and cost me only time and about $25 worth of seed, plant starts, and soil amendments (p. 57). My favorite thing about Sunflower Houses is that the activities are virtually free, other than the cost of basic gardening necessities. Many ideas that do not even require an official garden. I wish there were more chapters for fall and winter as well. Sunflower Houses highlights the wonderland that waits in our own backyard. It reminds me of simple summer days as a child, creating daisy chains and blowing dandelion seeds into the wind.